We enjoyed our stay at the LTGH. Our trip was planned around meeting our military son at a half way point to deliver a few items rather than shipping them. Alpine ended up being a great central location for all the fun we packed into our 3 day trip. We drove to Balmorhea pool, Ft. Davis State Park, McDonald Observatory Star Gazing Party, and out to Big Bend National Park. Every where you look, beauty captivates you. The LTGH was our place to rest and refresh for the next outing. The beds were comfortable and the air conditioner in the living area kept it cool enough that we didn't have to use the bedroom air conditioners. The ceiling fans were excellent at keeping things circulating and comfortable. It was clean and well stocked for those that would like to cook meals. We even enjoyed a few games at the large dining table. For the price, it made our trip affordable and we would definitely stay again. My only complaint would be the water pressure in the shower. The rest of the sinks were fine, I'm wondering if it is the type of shower head that causes this problem. There was enough pressure to get the job done, but it does take some extra time and effort. This was our second time to stay here and we loved it again! Perfect home close to everything in Alpine. We enjoyed our stay in the little tin house. It has everything you need after exploring the area. Most importantly, a comfortable bed to sleep in. It is great value for a family. My only criticism is that it needs a little "freshening up" - it was clean but could use a new shower curtain and rugs. 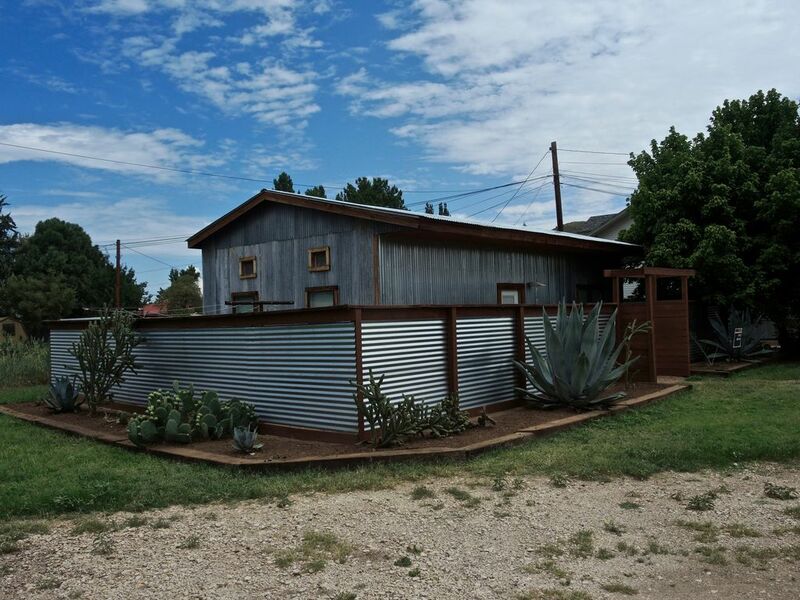 The Little Tin Guest house was perfect for our road trip to Big Bend. Beautiful property only about an hour and a half from the park. Would highly recommend. Cozy, clean, and perfect for a family of 4. Great place! Very comfortable and the bathroom was well-outfitted for all needs. Great place. Quiet with deer grazing in the front at night! Such an interesting town and The Little Tin House was the perfect place to come back to each night. Everything there that we needed. Would stay there again. Very convenient location to everything especially Sul Ross activities. • Le parc de la ville et de la piscine publique. Cancellation policy: A cancellation less than 14 days out results in forfeiture of first night's rent ($100.00) plus all processing fees charged to me by VRBO/Homeaway (usually around $40). The deposit is refunded for cancellations more than 14 days out less all processing fees charged to me by VRBO/Homeaway (usually around $40). $200 refundable security deposit after inspection. $50 cleaning fee Door code will be released once full payment is received.